Japanese Episode AG 056: "Hiito Bajji! Moeru Batoru de Getto da ze!" 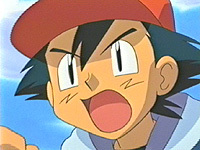 American Episode 328: "Going, Going, Yawn"
The time has come for Satoshi's battle for his fourth Houen League Gym Badge! Since the gang knows that Asuna uses all fire-types, Satoshi plans to use his Heigani to counter Asuna's pokemon. The battle begins before too long, and the first match pits Mag (Asuna's Magcargot) against Satoshi's Heigani. Satoshi's pokemon clearly has the upper hand for the majority of the battle, and before too long, Heigani pulls through with a victory! For her next pokemon, Asuna decides to call on Meg, her Magmag. Satoshi recalls his pokemon as well, and then calls out his second pokemon--Kimori! Asuna is surprised that Satoshi would choose to use a grass-type at a fire-type gym, but Satoshi boasts that even though Asuna has the type advantage, it won't mean anything if her attacks don't connect. For a while, Satoshi's pokemon is able to successfully avoid all of Magmag's attacks, but one of Meg's attacks does manage to hit Kimori, hurting its leg. Since Kimori's injured leg hinders its speed, Satoshi decides to substitute his Heigani back in. After a short battle, Magmag surprises Satoshi by using Yawn attack on Heigani, putting it to sleep! Satoshi recalls his Heigani and continues forward with his third pokemon, Pikachu. Pikachu is able to electrify one of Meg's Smog attacks, paralyzing it, before knocking it out with a Thunder attack. Asuna now calls on her third and final pokemon, Cotoise. Before too long, Cotoise is able to KO Pikachu with an Overheat attack, leaving Satoshi with only an injured Kimori and a sleeping Heigani. Satoshi decides to call on his Kimori, but Cotoise is able to quickly KO that pokemon with only one Overheat attack. Satoshi is now forced to call on his sleeping Heigani, who eventually wakes up after being hit by a barrage of fire-type attacks. Now that Satoshi's star pokemon is back in the battle, he has the pokemon tip Cotoise over on its shell before hitting it with a barrage of Bubblebeam. Asuna's pokemon faints, giving Satoshi the victory! Satoshi proudly accepts his Heat Badge and is congratulated on a job well done. I really think this is one of my favorite battles of the entire anime. I really liked the way we see Satoshi substitute his pokemon the way people do in real life when they play the video games. I also liked the fact that Satoshi's Heigani got put to sleep because I don't really remember Satoshi ever having to deal with one of his pokemon being put to sleep before (despite the fact that it happens all the time in the games). The dub doesn't have anything special to report. Ho-hum. The first second of the episode is cut. Two seconds are cut from the shot of Satoshi in the sand bath right before the opening theme. A second is cut right after the episode's title screen. Click on the image to the left to see a larger version of the picture. 4Kids removed Musashi's cleavage for this one shot. What's odd is that when the Rocket-Dan are shown blasting off again, Musashi's cleavage is left in, though that's probably due to the fact that the shot in question was so short. Another second is cut after Kids' WB! 's final commercial break.